In a large deep skillet over medium high heat add onion and oil. Season with salt and pepper. Cook for 5 minutes and then add pork belly. 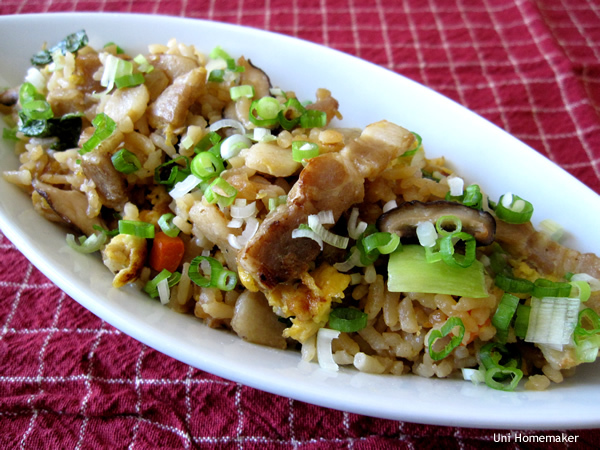 Cook for 2-3 minutes and then add carrots and shiitake mushrooms. Cook until mushrooms are slightly brown and then add eggs. Let the eggs set a bit but not completely cooked and then add rice. Break up the rice using your wooden spoon. Add soy sauce, sesame oil and sherry. Cook until everything is incorporated. Add the bok choy last, as it takes no time to cook. Check for seasoning and then garnish with chopped scallions. Wow!!! I really like it!!!!! Wow I got to print this out now and give it to my daughter. Sounds real good. This sounds great. Although, I’m a picky eater when it comes to animal fat (I’d have to remove all of the fat from the pork belly!). And, if you don’t mind my saying so, hoping you’re impending move is exciting rather than stressful. Thanks! 🙂 Let me know how it turns out. Hi Virgina, thanks for popping over! Let me know how it turns out if you do give this recipe a try. I know this is blasphemy, but this dish tasted awesome with a little sriracha sauce mixed in. I know, I know…blasphemy!